Free Resource Guides | Visions Inc. Depending on the finished product, your paper’s weight, brightness and finish can take the ordinary to extraordinary. See and feel the difference between paper weight (50# vs. 80#, text vs. color) and finishes (matte vs. gloss). See how color pops or blends into the paper of choice. Our Paper Sample Booklet lets you ‘feel’ the weight of 18 different standard paper stocks as well as ‘see’ color as a digital print output. 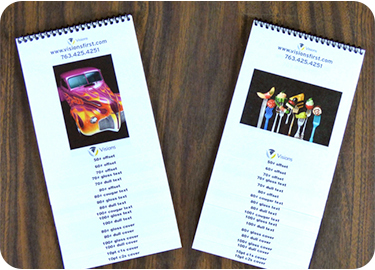 Request your free Paper Sample Booklet today! Please complete the form below to get your free resource guide.